You may recall me posting a piece on extraordinary landscape artist Anthony Garratt when he created four spectacular al fresco paintings on Anglesey in 2015. 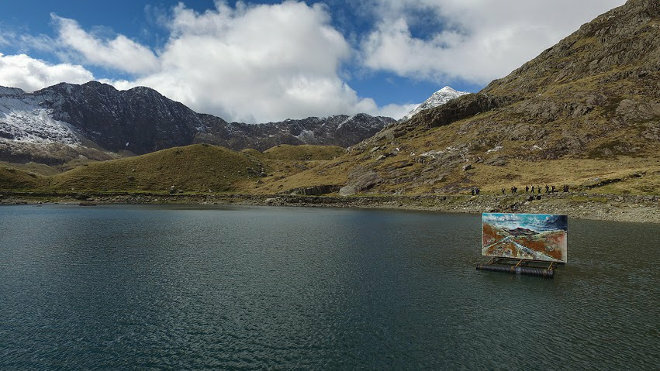 Anthony’s latest venture, High and Low, or ‘uchel ac isel’, captures the wild beauty of Snowdonia, with epic paintings and a film bringing together natural and manmade art. Sponsored by self-catering holiday company Menai Holiday Cottages, the film and outdoor painting installation offers plenty of jaw-dropping views of the area. “Menai Holidays hopes that the installation will tell the history, geography and industrial heritage of North Wales, and encourage visitors to make a deeper connection with the region’s dramatic landscapes and the incredible forces that have shaped them,” says Judith ‘Bun’ Matthews, the owner of Menai Holiday Cottages. A preview of the film, which accompanies the High and Low installation, has been released online, with a full-length version of the film due to tour arts festivals and galleries across the UK from the autumn of 2016. 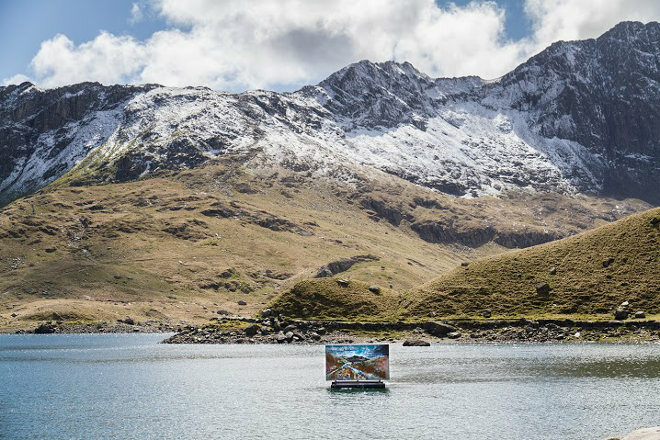 Like landscape artists Richard Wilson and JMW Turner before him, Anthony has drawn inspiration from the majesty of Snowdonia, in his case to fuel two immense paintings using water-based paint as well as naturally occurring local materials like slate dust and copper. 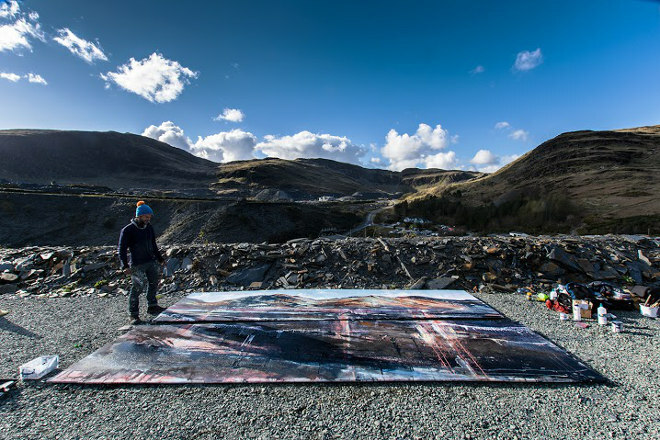 The two paintings were created directly within the views they represent, and are now in position – one floating with soaring light and reflections of Snowdon on Llyn Llydaw, and the other suspended deep beneath the mountains amid the shadows of an abandoned slate cavern at Llechwedd Slate Mine. What powerful motivation to visit Snowdonia and engage with it anew. If you would like to see ‘High’ should park at Pen-y-Pass car park and follow the Miner’s Track path which ascends Snowdon. The easy, track-based walk to Llyn Llydaw takes around 40 minutes. To see ‘Low’, head to Llechwedd Slate Caverns at Blaenau Ffestiniog. Entrance is via the mine visitor tour desk. The High and Low installation will remain in situ until the end of October 2016. Find out more at www.menaiholidays.co.uk/highandlow. All images credit Richard Broomhall / Fractured Ether. I love encountering outdoor art, particularly when those artworks join forces with their setting to enhance an area’s existing beauty. Done well, it has the power to engage people with nature and art in a way that’s really exciting. 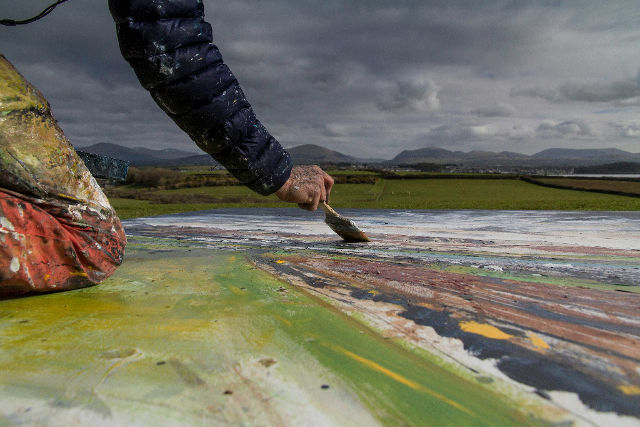 With this goal, landscape artist Anthony Garratt has created four spectacular al fresco paintings on Anglesey, painting them at the locations where they’re now displayed, on the north, south, east and west of the isle. Each artwork takes in a different iconic view: Caernarfon, Snowdonia, the Great Orme, the Lleyn Peninsula and the Irish Sea. The four 2.5-metre acrylic and oil canvasses have been hoisted onto bespoke steel structures to be enjoyed in the spaces they were inspired by and where they were painted. I think they’re amazing – really dramatic. I love the way they reflect and interact with the scenery. The project has been commission by Anglesey resident, Bun Matthews, owner of Menai Holiday Cottages. The outdoor art exhibition of ‘Four on Anglesey’ will remain in situ until October 2015. Do go along if you can, and if you do, let me know what you think.